The joy of changing a person`s life by creating positive relationships built on trust and the development of exceptional oral health is one of the rewards of being a dentist that is difficult to measure. I love practicing dentistry and serving my friends, family, and neighbors in the Holland, Zeeland, and Saugatuck communities. Memories of a positive childhood dental experience influenced my decision to pursue dentistry as a career. I received a Bachelor of Science in Biology in 2000 from Hope College. 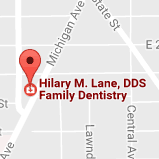 In 2004, I graduated with my Doctorate of Dental Surgery (DDS) from the University of Michigan School of Dentistry. Since then, I have completed advanced training in oral surgery, endodontics, and restorative dentistry through the general residency program at Meriter Hospital in Madison, Wisconsin. After several years as an associate dentist at both private offices and a non-profit health clinic in Grand Rapids, I started my career as a solo-practitioner here in Holland. I am originally from Kalamazoo, Michigan and have lived in Grand Rapids for 14 years. In my free time, I enjoy traveling and doing many outdoor activities with my fun-loving husband, two young boys, and chocolate lab.